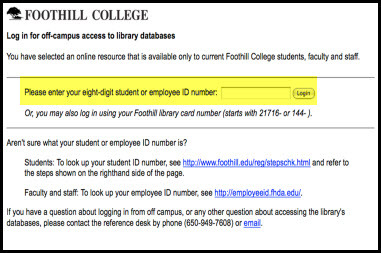 The Foothill College Library provides access to more than 30 online proprietary databases that provide the full-text of electronic versions of journals, magazines, newspapers, books, and videos. Did you know that you can link directly to specific articles, ebooks, streaming videos and/or other online resources from those databases? Whether you are teaching an online, hybrid, or face-to-face class, using Etudes, Blackboard, or a website, you can direct students to specific resources using a persistent link. They are permanent. Unlike the URLs displayed in a browser address bar that usually expire after a session ends, persistent links are stable. It is copyright compliant. Uploading PDFs of copyrighted articles or book chapters online can conflict with library database licenses and with copyright law. Using persistent links is the preferred method of providing access to these proprietary, copyrighted materials. To get started, identify the relevant database from the tabs above, and follow the directions. For questions, please contact a librarian at the Reference Desk at x7608. For off-campus access to the online databases, journals, and eBooks, use your eight-digit employee ID (as shown in the image below). What is a persistent link? A persistent link (also called a permalink, durable link, or permanent link) is a direct, stable link to a specific online article or other online resource that does not expire after a search session is over. The correct persistent link (image 1 below) is often given in the citation. Do not rely on the URL that appears in the address window when the article is open (image 2 below). What is a proxy string? Most of the library's databases require subscriptions to get access. Access is only granted to currently enrolled students, faculty, and staff. When on campus, access is relatively seamless since authentication is usually established by IP address, which identifies your computer as being on the FHDA network. However, when off campus, you need to be routed through the Library's proxy server, where you can be authenticated using your employee ID. If you are off campus while creating persistent links the proxy string will automatically be included in the link.